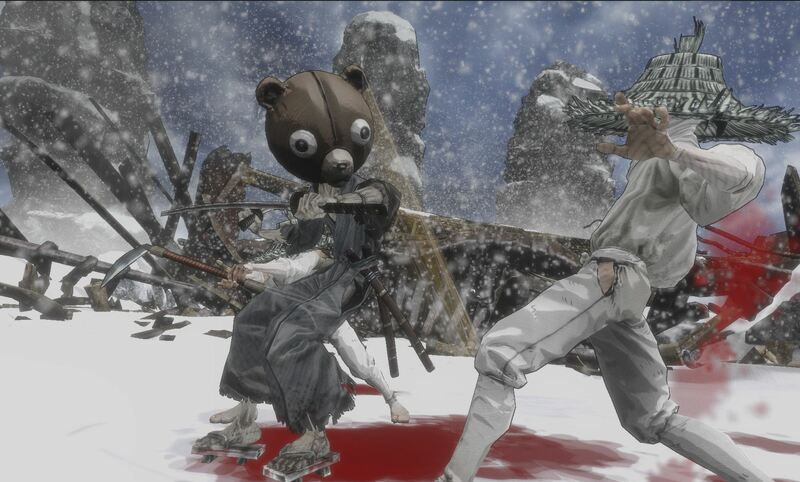 Afro Samurai 2: Revenge of Kuma holds close to the series premise when it comes to your overarching goal. 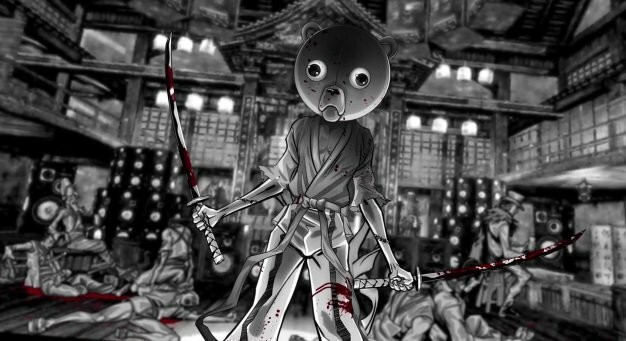 As Kuma, a minor character in the Afro Samurai anime upon which the original game was based, your one and only goal is to eliminate Afro. The reasoning behind this hatred is that Afro was your childhood friend and brother at arms, who chose the Number 2 headband above protecting your friends and family, specifically your younger sister Otsuru. 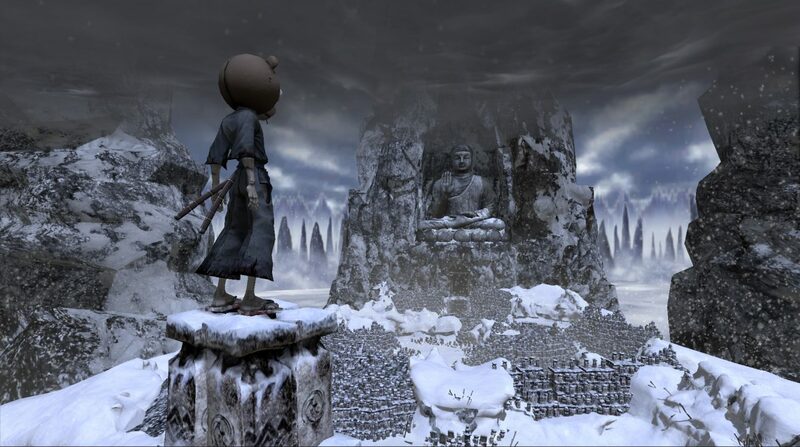 Picking up after Kuma received a serious beating from his would-be brother, the player must guide Kuma as he literally pieces himself together from cybernetic parts lost during the unseen battle. You see, Kuma suffered so much loss on that fateful night when Afro betrayed him that a majority of his body is now made up of robotic appendages and systems. As you progress through the first volume of a trilogy, you help Kuma achieve his full potential, find what remains of the Empty Seven, and pursue the legend of the headbands with the ultimate goal of taking out Afro. After you encounter Brother Three, one of the Empty Seven, he will become your guide in the game and the main conduit for the narrative to be conveyed. He’s a fun character, frequently breaking out into evangelical monologues on behalf of Kuma and shouting from the sidelines on how to progress. The mechanical systems that keep Kuma alive also carry over into gameplay, with microchips granting access to different fighting styles. As you progress through the pseudo-Feudal Japan of Afro Samurai 2, looking for leads on where Afro is hiding out, you’ll utilize three different fighting styles during combat. The three are: Afro, Kuma, and Master. 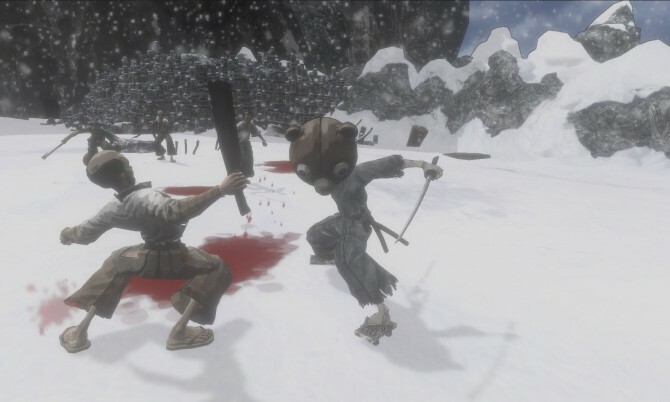 Afro allows you to vault over enemies and reflect projectiles, Kuma builds up a Dharma Rage meter which allows for instantaneous kills, and Master lets you slice enemies in an area of effect execution. Each of these can be switched on the fly, and allow for some variety in combat. Enemies are often times introduced with text or audio cues that push you to use a certain style against them. However, I found that Master style’s execution was the most effective way at dispatching foes. One point in the game, an armored samurai appears and the game tells you to use Afro style to vault over him and attack his exposed back. I did this, building up a combo close to one hundred hits before giving up and switching to Kuma style to unleash a one hit attack that took him out instantly. I found you should just stick to Master style since it lets you take out multiple enemies at once, and in the event the execution doesn’t work flip back to Kuma for some instant kills. I enjoyed the moments where I was free to engage with enemies, such as the latter stages where you are put into a endless assault requiring you to reflect arrows back at a DJ’s speaker system, or the final level where I cut my way through waves of zealous cultists who frequently exploded in suicidal flames. These moments were fun, but came after a long and slow introduction. On top of that, the singular boss battle is made up of quick time events that appear out of nowhere. The very first quick time event actually involves you getting stabbed when you succeed. This means as you match the button presses on-screen, you take damage. This is the opposite of what you would expect to happen and threw me off. Thankfully quick time events are restricted to two scenarios mid-game. Combat is fun, but happens too infrequently during this introductory volume. A majority of your time is instead spent walking through corridors or hallways as Kuma takes out his anger by constantly screaming his younger sister’s name. I should take pity on Kuma, but since his motivation is forced onto you again and again through flashbacks and inner monologue for the first hour of the game, I found him more annoying than sympathetic. Audio lines are repeated multiple times, which only degrade the narrative being told. Cutscenes will feature characters speaking but you only know that because the camera is focusing on them — they lack any sort of presence and movement on their own. 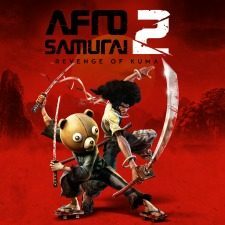 The best part of Afro Samurai 2 is the soundtrack, which is headed by rapper RZA. The tracks make for great background music while you slice up ninjas and criminals into bloody pieces. Even that can’t make for a recommendable game, however. There are some things to like in Revenge of Kuma Volume 1, and I can see what developer Redacted Studios was going for, even if they stumbled more often than not in its delivery.